As of 2006, the United States Centers for Medicare & Medicaid Services (CMS) began offering a prescription drug benefit known as Part D to Medicare beneficiaries. In addition to managing the coverage of specified medications, participating sponsors in the Part D program must provide eligible Medicare beneficiaries with access to medication therapy management (MTM) services (CMS, 2018b). One of the MTM services is an annual comprehensive medication review (CMR), where a qualified provider reviews with the beneficiary all medications (i.e., prescription, over-the counter, herbals, and supplements) that are being taken and identifies and resolves any medication-related problems. The beneficiary receives a written summary after the review, which includes a cover letter, medication action plan (MAP), and personal medication list (PML). As of 2013, CMS requires that the written summary follow a specified configuration known as the Standardized Format (SF). The SF should contribute to the intent of the MTM program, which is to enhance safe and effective medication use. Preliminary research on the SF provided the current authors with insight on beneficiary use and satisfaction. In 2015, a survey was administered to 30 Medicare beneficiaries who had received a CMR (Cooke, Kaiser, Natarajan, & Brandt, 2015). One third could not recall their SF, and 28% of those who remembered receiving a SF stated that they preferred a shorter PML when they are taking multiple medications. The utility of a long PML was examined in another survey of nine Medicare beneficiaries who had also received a CMR (Cooke et al., 2015). In the survey, 67% of beneficiaries noted that they created a separate, smaller handwritten list of medications for reference, presumably because the PML was not user-friendly. Other stakeholders have also continued to raise concerns. Sharing the perspective of those implementing the SF requirement, the Academy of Managed Care Pharmacy® (AMCP; 2016) noted that the average SF is “10+ pages and costs an average of $1.39 to mail to the beneficiary” (p. 3). The SF is meant to be shared with the beneficiary's caregiver(s), care coordinators, and health care providers. Clinicians and others in the field are concerned with the static nature of the SF, and the lack of electronic integration into the beneficiary's health care information (CMS, 2013). Despite increased provider demand for electronic access to medication history (Gabriel et al., 2015) and the steady increase in electronic exchange of health information among providers (Swain, Charles, Patel, & Searcy, 2015), the SF remains separate from the electronic medical record. 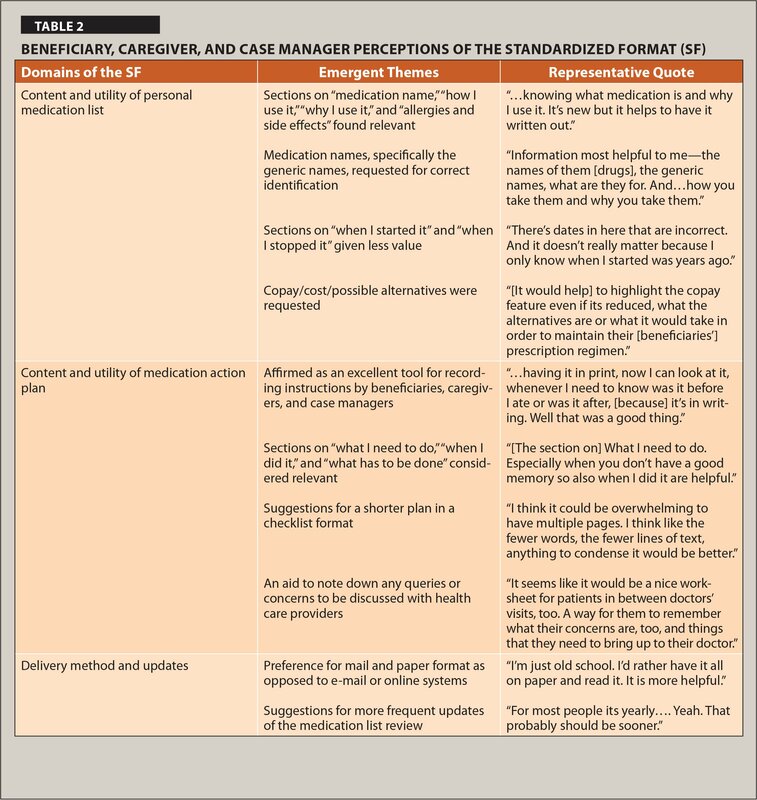 Because there is limited published evaluation of the SF, the objective of the current study is to describe beneficiary, caregiver, and care manager perceptions of the Medicare Part D MTM SF, including its components and delivery method, and to inform potential modifications for its optimal use. To attain an in-depth understanding of Medicare beneficiaries' opinions and perceptions regarding the MTM SF, focus group interviews were conducted. During the process of qualitative research, the extensive prior knowledge of a researcher on the research topic may introduce biases into data collection and analyses; hence, bracketing can be a useful tool to control this bias (Tufford & Newman, 2010). A bracketing exercise was conducted with researchers prior to the interviews. Memo writing was selected as the means of bracketing wherein research team members were given time to examine and contemplate their individual opinions and perceptions on the research topic through open-ended questions. Memo writing was followed by a group discussion to acknowledge and deliberate over any preconceptions, thus ensuring a more robust and meaningful study. Members of the AMCP MTM Advisory Group were asked to assist with identifying potential beneficiary participants and sites for the focus group interviews. MTM Advisory Group members contacted beneficiaries directly by telephone using a script developed by the University of Maryland School of Pharmacy (UMSOP). If the beneficiary was interested in being contacted, his/her name was sent to the UMSOP via secure electronic transfer. The UMSOP then contacted potential participants to further elaborate on study goals and terms for participation. During the telephone call, verbal consents to participate and collect participant demographic data were requested. For those who consented to participate in a focus group interview, a confirmation letter with specific directions to the site was sent in advance of the meeting via the United States Postal Service or e-mail. Case managers were contacted by networking among UMSOP contacts and through outreach with professional organizations. Focus group interviews were conducted with Medicare beneficiaries who had received a CMR in the past 1 year, their caregivers, and case managers. The University of Maryland Institutional Review Board approved the study. A semi-structured facilitator's guide for the focus group interviews was designed with open-ended questions. The framework to build the facilitator's guide was adopted from previous work accomplished by partnering organizations (Cooke et al., 2015; Moon et al., 2016). Questions in the interview guide were developed within a five-category framework of (a) awareness of the SF, (b) overall value of the SF, (c) content/usability of the SF, (d) delivery method for the SF, and (e) portability of the SF. A facilitator conducted the focus group interviews in English, which were audio recorded, transcribed, and proofread by two independent research team members. Each transcript was independently coded by two researchers using NVivo® version 12 qualitative coding software. The semi-structured interview guide was used to develop a coding scheme. For instance, a question on the utility of the PML was: “Which information was the most important to you on the medication list, and which was the least?” Two codes, PML info important and PML info not important, were later generated around this question. Once the coding scheme was determined, it was followed by a perusal of all transcripts, after which the coding scheme was further refined. Next, each coder applied these codes to the transcripts. Once independent coding was completed, the two coders compared and discussed their coding to reach agreement. When differences in the coding were unresolved, the other research team members, including the primary investigator, were consulted and a consensus was reached. The coded quotes were then used to identify pertinent themes. The AMCP MTM Advisory Group members involved in recruitment referred 42 potential beneficiary participants to the UMSOP team. Two individuals provided information on their spouse/caregiver and these individuals were also included. In addition, eight case managers were recruited. A total of 28 individuals were consented telephonically, and 23 participated in one of the five focus group interviews conducted between February and April 2018, at locations in North Carolina, New York, Arizona, and Maryland. Table 1 provides demographic information on those who consented to participate in the focus group interviews. Of note, the majority of participants were younger than 65 (54%), female (64%), and White (75%). Approximately all participants had at least a high school education. Table 2 presents some of the key statements based on the five-category interview framework: (a) awareness of the SF, (b) overall value of the SF, (c) content/usability of the SF, (d) delivery method for the SF, and (e) portability of the SF to illustrate emerging themes. Below are additional results and recommendations from the focus group interviews. …a lot of our clients will have like three or four or five or more physicians that they are working with and especially if they are in two to three different systems, there's very little communication so that's really helpful you know...if we had something that we could put everything from all of their physicians on one page for them to see…would help. I can tell you I have been doing this for over a decade and I don't think I've had one patient that could tell me exactly when they started using something or when they stopped. So, to me that's irrelevant…. Maybe it could be useful somewhere. Many participants considered the details provided in the medication list to be valuable as they could be readily shared with their health care team. Some beneficiaries and case managers also put forward a request to add a section on cost. Suggestions included adding the actual medication cost or medication formulary tier within their insurance plan. This information was perceived to be crucial to help them make better decisions and discuss alternatives with their health care team. I would say that the more pages, the worse it is, and people are not going to sit down and fill it out…. I have seen a very good medication list where it's on the same page…. You know it gives a very nice snapshot versus this one where if you lose a page, it's over, and as a provider you have to flip through four to five pages of medications, [which is] not useful. Medication Action Plan. In most cases, beneficiaries and caregivers believed the MAP sections on “what I need to do,” “when I did it,” and “what has to be done” provided pertinent information for daily use. This information was especially important for those who had difficulty in recalling the medication review discussion or instructions. Of beneficiaries who recalled receiving the SF, they said they got it in the mail and mostly approved of this method of delivery after their CMR. Although some beneficiaries were familiar with the internet and operating a computer, many others said they had difficulty getting access to a computer as well as operating it to check anything online. Case managers agreed that most of their patients would have difficulty accessing the internet and favored delivery by mail. My thought is—with everybody now mandated to have electronic medical records—it should be that every time there is a medication change, it should trigger the new plan being filled out and…sent to the patient. I think with each medication change it should be done. Also, a yearly visit should be a minimum of when that needs to be updated. Most case managers concurred, and some recommended creating an online chart or list that could be updated as soon as there is a change in any medication. They also believed that if caregivers and case managers had access to these documents, it would ensure better health outcomes. Participants made several suggestions for information they believed should be included in the SF. The information they sought included dosage and timing for medications, side effects, and drug interactions with other drugs already on the list. The interaction that and any other drug they put me on is important to know. Because I normally have to call a cardiologist to know is it safe to take this medicine with the one I'm taking or not safe with the eight drugs I'm taking. Case managers put forward several more information requests in addition to those noted above, including whether patients can afford their co-pay and where they fill their prescription(s). They also requested information on dose and schedule alternatives for their patients to improve medication adherence. Medication-related harm is described in terms of adverse drug reactions or adverse drug events, which occur more frequently in older adults due to polypharmacy as well as age-related pharmacokinetic and pharmacodynamic changes (Parekh, Ali, Page, Roper, & Rajkumar, 2018). This is noteworthy because the rate of medication-related harm, noted by U.S. emergency department visits, has doubled (Shehab et al., 2016). To reduce medication-related harm, access to an accurate and up-to-date medication list is vital (American Geriatrics Society Beers Criteria® Update Expert Panel, 2019). Provision of this resource is the responsibility of the health care system to sustain meaningful workflow changes that impact the delivery of person-centered care. For instance, in 2011, CMS established the Medicare and Medicaid Electronic Health Record Incentive Program to encourage eligible professionals, eligible hospitals, and critical access hospitals to adopt, implement, upgrade, and demonstrate meaningful use of certified electronic health record technology. The Meaningful Use Program “Promoting Interoperability” will focus on interoperability, improve flexibility, relieve burden, and place emphasis on measures that require the electronic exchange of health information between providers and patients (CMS, 2018a). This initiative needs to consider programs such as Medicare's Part D MTM Program, along with medication reconciliation initiatives, and patients' preferences to ensure integration and minimize the burden on Medicare beneficiaries and those who care for them. Better care: improve the overall quality of care by making health care more patient-centered, reliable, accessible, and safe. Healthy people, healthy communities: improve the health of the U.S. population by supporting proven interventions to address behavioral, social, and environmental determinants of health in addition to delivering higher-quality care. These aims can be achieved in concert with patients' goals of care if there is effective information exchange across care settings. Ideally, the IMPACT Act will further the work of longitudinal care planning. Initiatives such as electronic care planning rely heavily on medication lists. Transforming the SF into interoperable elements meaningful to beneficiaries would help address integration and improve goal attainment of increased medication effectiveness and safety for Part D beneficiaries (Look & Stone, 2018; Ogle, Cooke, & Brandt, 2015). Nurses across care settings are critical in coordinating care and communicating MAPs. This information provides guidance to the health care team that focuses on the medication-related needs of Medicare beneficiaries and care partners. These recommendations must be incorporated into future revisions of medication documents, such as the SF, as well as medication lists and care plans. The current study findings illustrate that the information available from the SF is helpful but often the “take-away” is forgotten or underutilized. This study also adds to the body of literature that beneficiary-focused information should be concise and integrated into the delivery of care and a patient-centered care plan. Additional work is needed to evaluate how the SF can be modified to improve usability as well as demonstrate impact on reducing medication-related harm in older adults. Dr. Sharma is Postdoctoral Research Fellow, Dr. Cooke is Research Associate Professor, Dr. Howard is Pharmacy Resident, and Dr. Brandt is Professor, Geriatric Pharmacotherapy, Department of Pharmacy Practice and Science, University of Maryland School of Pharmacy, Dr. Brandt is also Executive Director, Peter Lamy Center on Drug Therapy and Aging, Baltimore, Maryland; and Ms. Chater is Director of Clinical Healthcare Strategy, Omnicell Inc., Raleigh, North Carolina. Dr. Brandt received a grant from the Academy of Managed Care Pharmacy®. The remaining authors have disclosed no potential conflicts of interest, financial or otherwise. Address correspondence to Nicole J. Brandt, PharmD, MBA, BCGP, BCPP, FASCP, Professor, Geriatric Pharmacotherapy, Department of Pharmacy Practice and Science, University of Maryland School of Pharmacy, and Executive Director, Peter Lamy Center on Drug Therapy and Aging, 20 North Pine Street, Baltimore, MD 21201; e-mail: nbrandt@rx.umaryland.edu.